What is a Saladbox? Simply put, Saladbox is a mystery box full of beauty products. You'll never know what you're going to get each month until the box arrives at your doorstep! 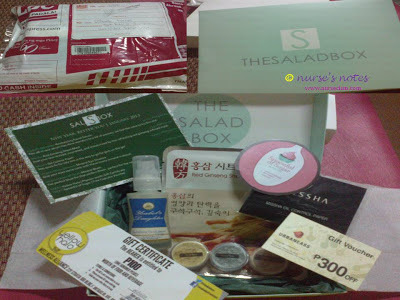 There are five My Saladbox plans namely: monthly recurring, six-month prepaid, one-year prepaid, Saladbox Lite and Saladbox starter. There are plenty of options on how to pay for your Saladbox. Yes, the box is not for free unlike the products over at SampleRoom. But, the good thing is, the products inside the box are handpicked by them based on your beauty profile. SaladBoxes are set to be shipped around the 21st of every month! So expect yours week after next! :) Have a great day ahead! When I opened the box, I was really surprised. lol. I haven't used any of these products before. But, somehow, that is the essence of subscribing to a mystery box---to be surprised (!) and try out new products. Too bad that the gift certificates won't be of any use to me because I live in the far far away land. I'll let you know what I think of these products after I tried them out! Overall, I like this January Saladbox. I am just quite unsure if I would subscribe for the next box or I'll try other boxes. Unsolicited suggestion: Would be better if they'll send updates via e-mail. That's all. Thank you, Saladbox! I thought to would be a box of salad =). Nice beauty products that is for you to enjoy. I'm sure the products in your surprise box would come in handy. wow.. I think this would definitely be cool for reviews since you get lots of new stuffs.. I already signed up to Saladbox but I really havent browse through it. haha! You got me excited. Will try this now. How much do you pay for a salad box? they looks great. Though my wife likes surprises, she's the type of person who wants to make sure that she knows what to put in her face and body. I thought Saladbox is a container full of Salad hehe. Learned a new thing or term here that is pretty useful around the fashion community! Akala ko, fruit salad box. LOL. Nice stuff inside your box. Sana there is a similar Saladbox for boys. I thought it food and I laughed until finally finished reading your post and I love to try salad box but I don't know any of the product at your box. lol.